Burdened by stress and a lack of time, Brits now more than ever crave convenience and speed in various aspects of their lives. One area where this is particularly true, is within their home environment. Individuals are therefore gradually adopting smart home technology which they can remotely control through their smartphones and tablets to facilitate a ‘connected home’. The rise of smart home technology has been nothing short of fascinating. In fact, recent findings from ‘Smart Home Week’, found that 43% of Brits now own at least one smart product in their home. When it comes to their understanding of the technology, 49% of UK consumers are familiar with the features and benefits of smart home products according to research by ‘Ernst & Young (EY)’. 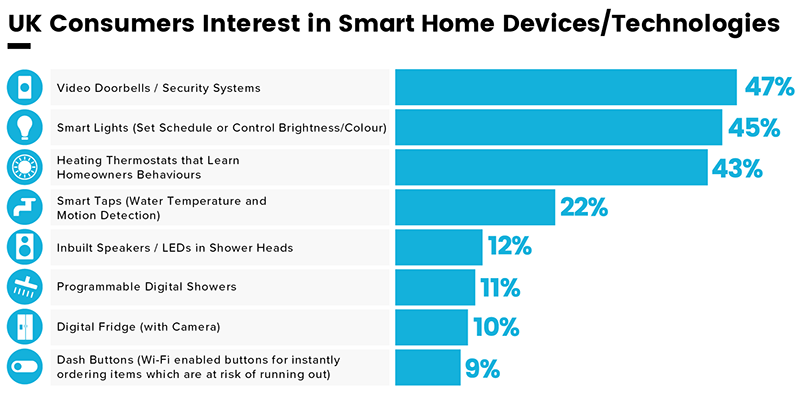 Interested in connected homes, housing agents Sellhousefast.uk analysed findings from Eureka!, who surveyed 946 UK households to better understand their current attitudes towards a range of factors concerning smart home technology. Sellhousefast.uk found that the ‘lounge’ is the room which the majority (72%) of homeowner’s think is most ideal for smart technology. Thereafter, Brits believe the ‘kitchen’ (53%) and then, ‘bedrooms’ (34%) are the next best suited spaces for accommodating smart technology. Contrastingly, the ‘landing’ (12%) is the part of the house which Brits feel is the least suited for smart devices/products. Furthermore, Sellhousefast.uk also sought to find out the smart technology devices/products that UK homeowners would be interested in buying/installing within the next one to two years. It was revealed that ‘video doorbells/security systems’ is the smart technology that most appeals to Brits, with 47% planning to purchase either one or both within the next two years. Just slightly below, 45% of Brits want to install ‘smart lights’ over the next two years, which they can wirelessly adjust the brightness/colour of as well as schedule, as and when needed. On the other end of the scale, ‘dash buttons’ (nine percent), which are small WiFi functioning devices that enable consumers to order their favourite product from a certain retailer at the touch of a button, was the smart technology which garnered one of the lowest amounts of interest from Brits wanting to get it within the upcoming one to two years. When considering the methods Brits would explore for getting advice on smart home technology, most Brits would opt to do so by directly contacting a smart tech manufacturer (41%) like ‘Nest’ or ‘Hive’. Subsequently, 39% of Brits would use an internet search engine such as google to get more information on smart home device(s) they are interested in. Surprisingly, only nine percent of Brits are likely to ask for recommendations on social media when seeking out suitable smart technology for their home. Robby Du Toit, Managing Director of Sellhousefast.uk commented: “The growth of smart home technology over the last few years has been phenomenal. Despite Brits being initially sceptical towards the technology, improved understanding and more affordable pricing has given smart devices greater appeal. “This research certainly shows that Brits are beginning to have a firm grasp of the smart technology they desire and would be willing to actively use in their home. Looking into the future, with the integration of smart home devices expected to become a real incentive for prospective buyers/renters, the technology could play a fundamental role in increasing the overall value of properties”.